This DVD is my first experience with Jake and the Never Land Pirates. I've seen commercials but it just didn't look like something I'd be interested in, but then I was offered review DVDs of Jake and the Never Land Pirates: Jake's Never Land Rescue and Mickey Mouse Clubhouse: Super Adventure , so I figured what they heck. Both shows are meant for young kids and are aired on Disney Jr. There are a lot of cartoons out there that can be enjoyed by both both kids and adults, but I found these shows to be just too simple to hold my attention. 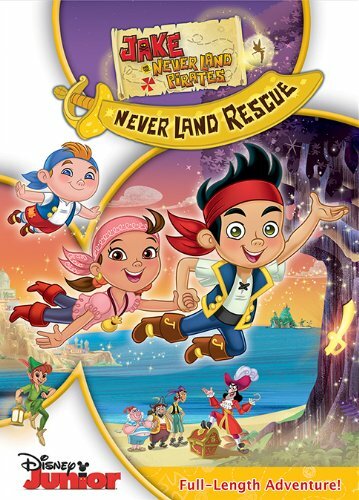 Jake and the Neverland Pirates is about a group of pirate kids, Jake, Izzy, and Cubby, and their parrot Skully, who have adventures in Neverland. Captain Hook and Mr. Smee also appear and often try to find the kids' pirate treasure. It's one of those shows where the characters talk to the kids watching the show and then pause while they wait for a response. So yeah, for very young kids, and that means the stories are very simple and pretty much no character development. The story here in Jake's Never Land Rescue is that objects are disappearing all around Neverland, including Neverland itself. Jake learns the reason behind this is that the Forever Tree, which supplies the magic of Neverland, is old and dying. In order to prevent this, Jake must go on the Forever Quest to collect a sword, a map, and pixie dust, and bring it all to the Forever Tree. And of course Captain Hook doesn't make things any easier! JThe Golden Twilight Treasure! / Rock The Croc! JJake And Sneaky LeBeak! / Cubby The Brave! Jake's Special Delivery / Seahorse Saddle-Up! Plus there are eight Playing With Skully cartoon shorts, and packed inside the DVD case is Jake's sword and glow-in-the-dark star stickers. For the young ones, I think this would likely be a good cartoon, but for me, I had a hard time staying awake through most of it. Jake and the Never Land Pirates: Jake's Never Land Rescue , released by Walt Disney Studios Home Entertainment, is available starting November 19, 2013.